Chef Dave's first word wasn't "mama" or "papa", it was "apple". He began his culinary career picking and selling Blackberries at the ripe old age of 8. He began "playing with food" at his father's restaurant the Mushroom in Westport, Connecticut when he was twelve. After finishing a marketing degree from Florida State University, David returned to Atlanta and opened his first restaurant when he was 23, an Italian bistro, The Gourmet Grill. He later went to work for The Buckhead Life Group under Paul Albrecht at Pano's and Paul's. In 2001 David opened the Five Seasons Brewing Company in Sandy Springs to feature local handcrafted beer and food served side by side. 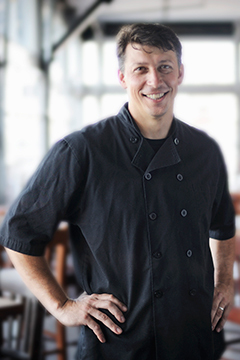 Chef Dave works with local farmers and believes strongly in local, organic and sustainable foods. "At the end of the brewing process, we take the left over grain and trade it for organic vegetables or use it to feed Ossabaw pigs. Some restaurants talk about having fresh vegetables, we help to grow and even pick our own". These vegetables change week to week, and even day to day during the peak of harvest. Not all of the grain is traded. Some of each batch goes into making one of the finest loaves of bread available in the city. In addition to vegetables, Chef Dave also uses local cheeses, organic local grass fed beef, local organic pork, pastured poultry, pastured eggs and sustainable seafood. On top of our full menu we feature 20 to 30 specials a day at each location to share the seasonal foods we are so lucky to have and serve. This allows guests to eat here every day and try something different and makes the 5 Seasons a truly unique dining destination. The 5 Seasons has been rated one of the best breweries in the world numerous times on ratebeer.com and recently featured as one of the top two breweries in America on the Travel Channel. The restaurants have won many awards for being among the best in the Atlanta area and provide a truly unique experience of local handcrafted award winning food and beer. David was awarded a Rising Star Chef award with a special distinction for Sustainability in 2007. Dave and his food have been featured in numerous local, national and international publications and programs such as Good Eats, Good Morning America, CNN, Better Mornings Atlanta, In Style, Atlanta Magazine and many more. There are currently 3 Five Seasons locations in the Atlanta area including Alpharetta, Sandy Springs and on the Westside.